At its ignite event in Orlando, Microsoft announced the availability of office 2019 for Window and Mac, alongside a test version of files on Demand which allows users to see all their OneDrive files on the Mac Desktop and only download what needs to be used. The office releases features numerous features that have been added to office 365 ProPlus, its cloud connected version, over the course of last three years. Commercial value licensing customers can access office 2019 immediately, while it will become available all customers in the coming weeks, Microsoft said. It’s described as a “One Time release” that won’t receive future feature updates”. 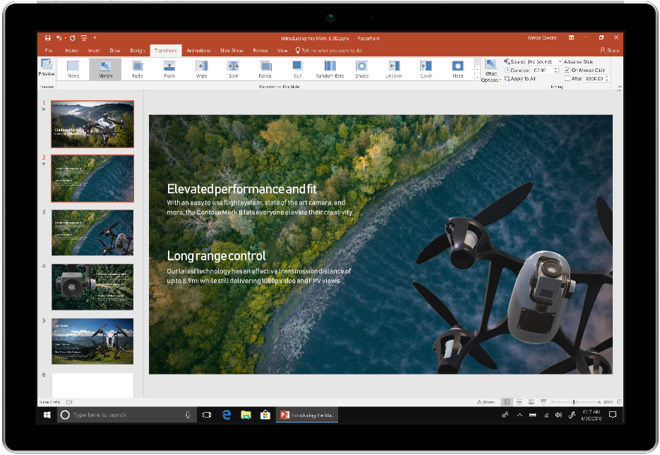 “For customers who aren’t ready for the cloud, office 2019 provides new features and updates to the on premises apps for both users and IT professionals” Jared Spataro, Corporate vice President for office and Windows Marketing wrote in the post. The office suite for windows, as usual includes Word Excel, PowerPoint, Outlook, project, visio, Access and publisher with Word, Excel, Powerpoint are available for the Mac. New features include the addition of “Morph” and “Zoom” to PowerPoint, new Data Analysis features on Excel and the new addition of Read Aloud and text spacing to Word and Outlook. Microsoft announced the availability of the files On Demand for Mac, which allows Mac users to “access all your files in OneDrive without having to download all of them and use storage space on your device”. It arrives along with Mac OS Mojave, which also became available Monday. Files on Demand allows users to see files in the finder on a APFS formatted volume in Mac OS Mojave and allows access to them if the computer is connected to the internet.